As you may already know, at the beginning of every month, we drop a fresh batch of Who What Wear collection arrivals in-store and on Target.com. However, this one is extra notable, as it's the first of three monthly installments of our new collection for fall. That's right: new silhouettes, new prints, new textures, accessories, and, most importantly, new trends—all for you and all under $50. And they're nearly all available in sizes XS to 4X, so we mean it when we say it's a collection for everyone. From standout dresses to weekend tops to statement bags, we've got everything you need for a stylish season ahead at prices we can all wrap our heads around. And for shoes so good they deserved their own post, you'll want to check out this story next. Shop our personal favorites below, and then be sure to check out the full collection on Target.com or hit up a Target store—because there were simply too many to choose from. This top is your first step in re-creating the look you just saw. Not even we can believe this bag is only $30. Wear these to work or on the weekend. Lace just makes everything better. If you love statement jeans, we also suggest considering this pair. There's nothing like the perfect shade of dusty pink. For a street style–inspired look, layer this over your day-to-day crossbody bag. Who can say no to corduroy detailing? The only thing better than statement jeans are affordable ones. 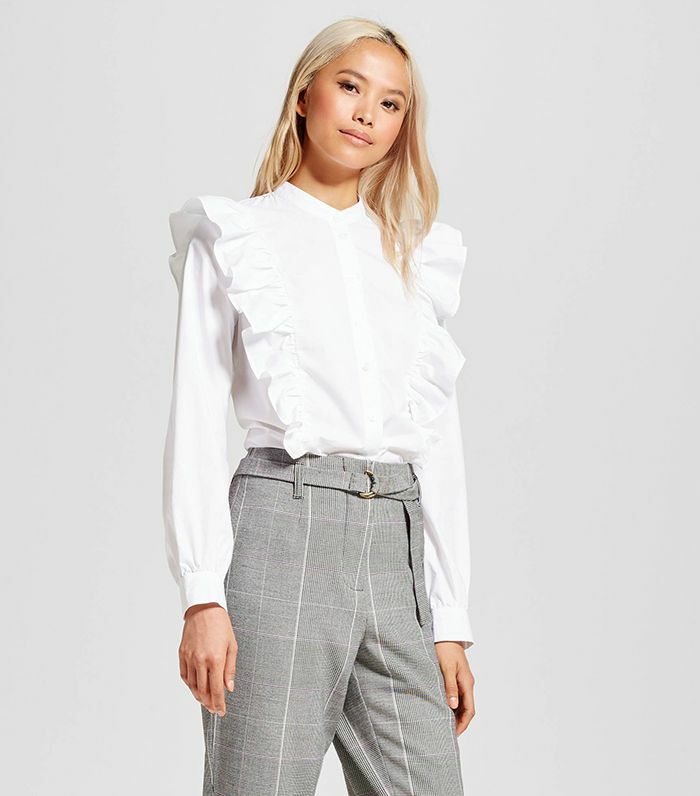 Your work wardrobe deserves this chic upgrade. Whether or not you're going "back to school," you'll want this. Wear this with a T-shirt and literally any shoe style, and you're ready to go. Scarves are the perfect way to give every look a special touch. This color will go with everything you own. If your old army jacket is begging to be retired, this updated version is for you. This is the perfect cold-weather night-out top. A must for the perfect travel outfit. This is the ideal wear-with-anything top. Our beloved cropped trousers just got a flattering update! Time to upgrade your LBD. Dark floral is one of our favorite unexpected prints for fall. A sweater like this can be worn year-round. This perfect skirt comes in black too, of course. So good, we had to make two versions. Another must-have update to the denim jacket. Also available in sizes S to L.
Another day, another track-inspired piece to love. This woven strap makes all the difference. Don't forget to check out our shoe collection here, and then of course shop the full line including these pieces and more in stores or at Target.com.